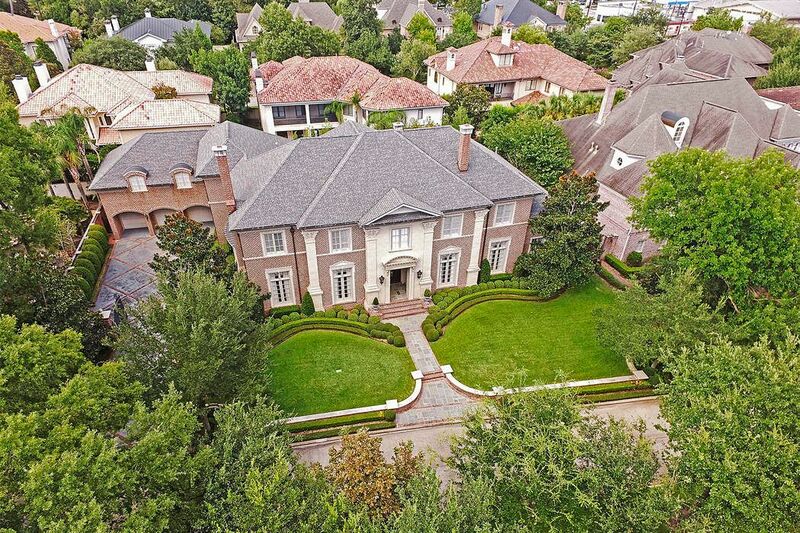 8610 Stable Crest Boulevard, Houston, TX 77024 | Martha Turner Sotheby's International Realty, Inc.
Gracious custom Georgian residence in the gated/guarded Stablewood subdivision. 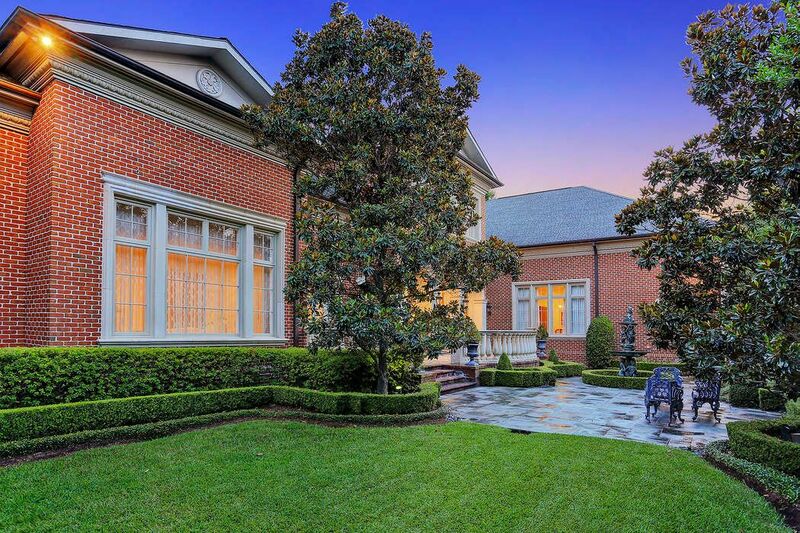 Designed by Robert Dame and built by Barnett Custom Homes, the home is situated on a 20,691 +/- square foot lot on the beautifully treed and groomed boulevard. An aerial view of the property showcasing its location along a beautiful tree-linen boulevard and the sizable motor court. 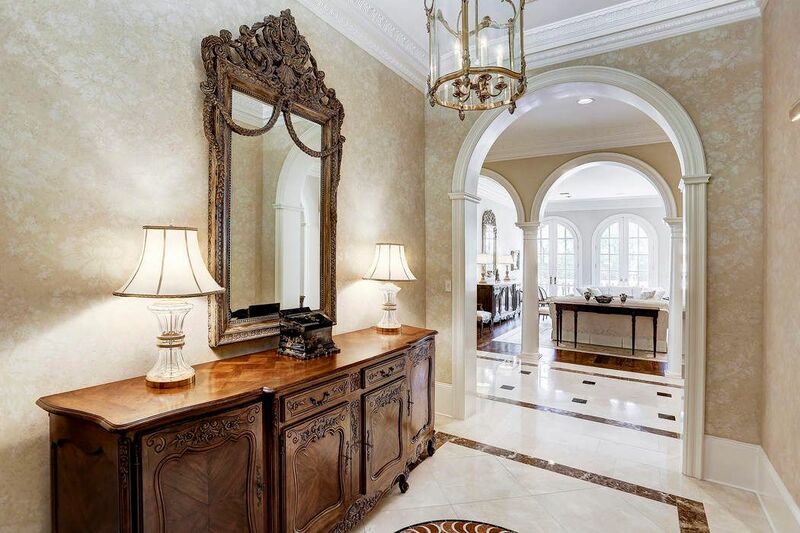 The FRONT ENTRY (13 X 9) includes handsome marble tile flooring/decorative inlay, painted walls with stencil detailing, stately wood double door entry with glass transom above, crown/base molding and arched entry to the GRAND FOYER (9 X 20). 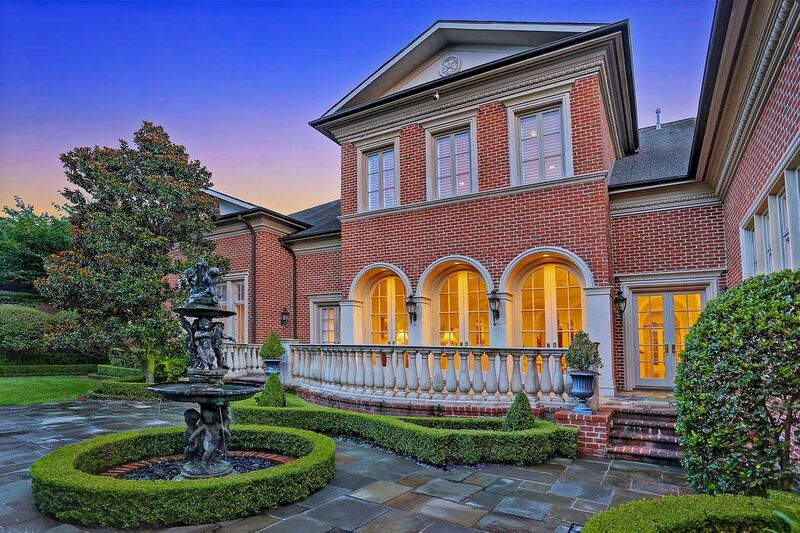 As seen from the Grand Foyer with its series of stately arched openings (painted wood trim/columns), a view of the formal LIVING ROOM and its impressive French doors leading to the backyard patio and garden. A great floor plan for entertaining! 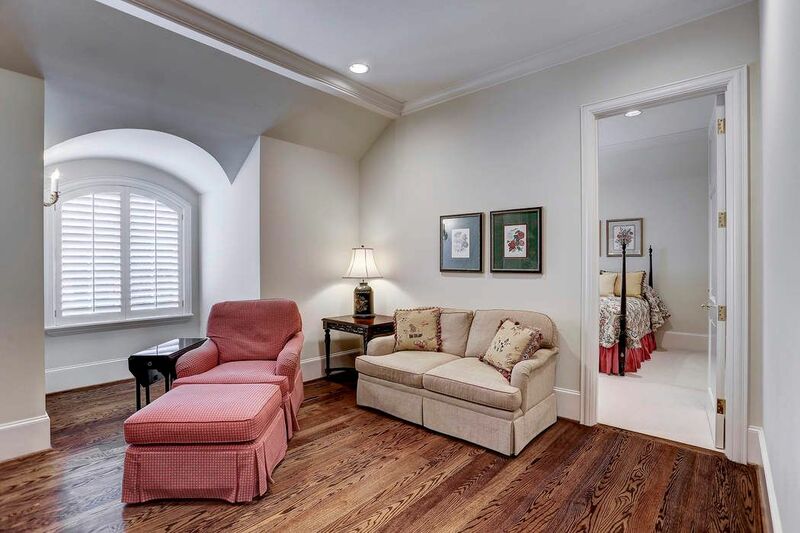 The spacious LIVING ROOM (26 X 21) features detailed treatment of crown molding/ceiling accents, centrally located fireplace (wood mantle/marble surround), hardwood flooring, delicately painted walls, built-in speakers and art/recessed lighting. 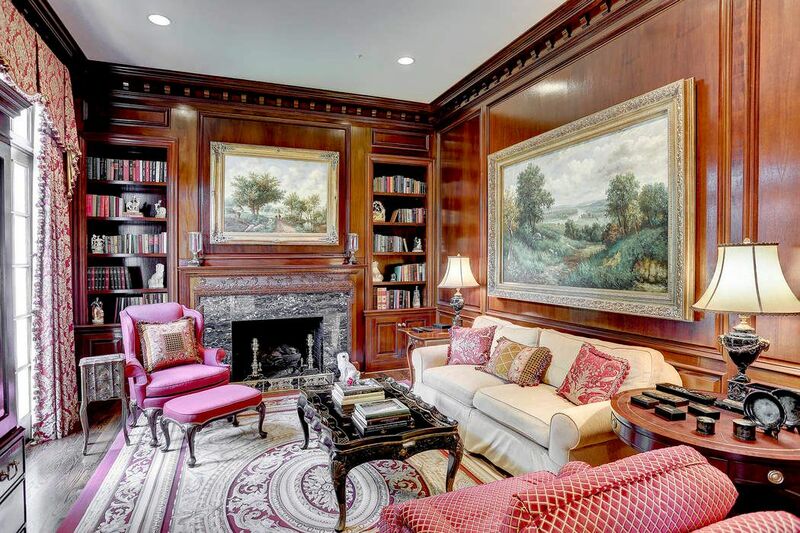 The downstairs LIBRARY (18 X 13) features oak hardwood flooring, recessed/art lighting, mahogany block paneled walls/dentil crown molding/ built-in bookshelves, fireplace (marble surround/wood mantle), pocket doors, mullioned windows/transoms above. 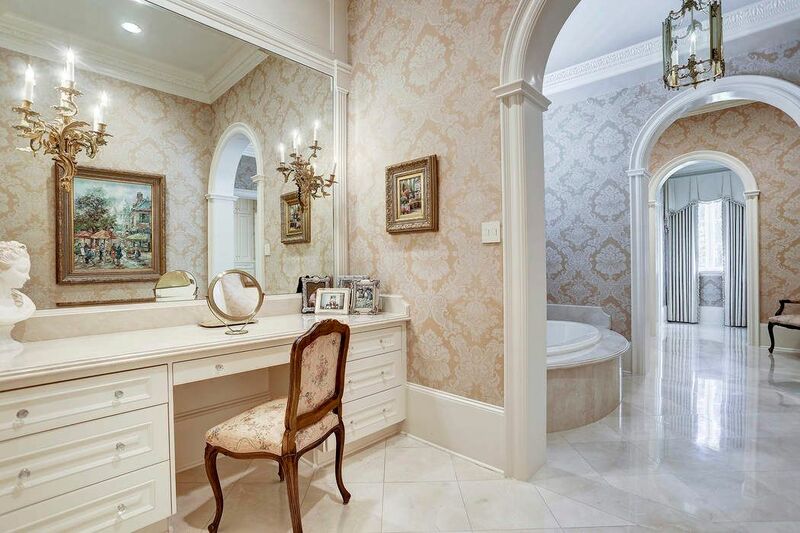 The formal POWDER ROOM is beautifully finished with stenciled walls, hardwood flooring, 14K gold leaf raised ceiling, built-in cabinet with lighted crystal sink/decorative fixtures/marble counter top, water closet. 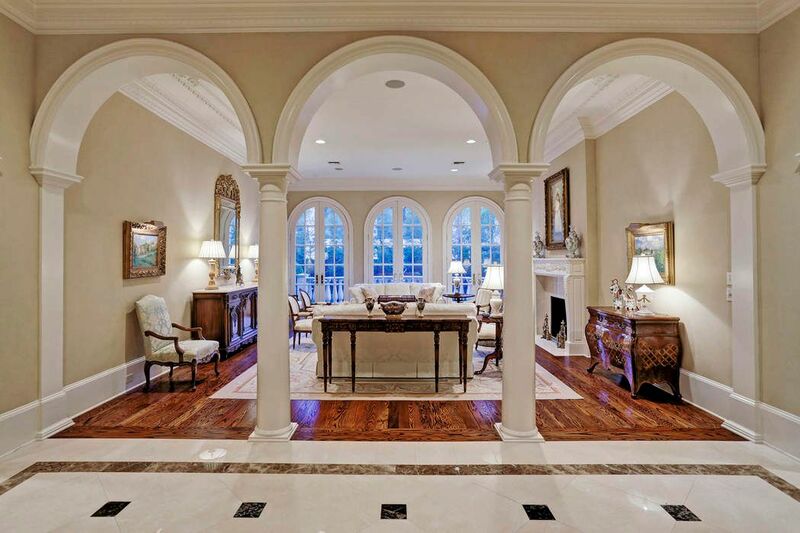 A view showing the Grand Foyer as it opens to the columned LIving Room entry and proceeding down to the elegant Dining Room. 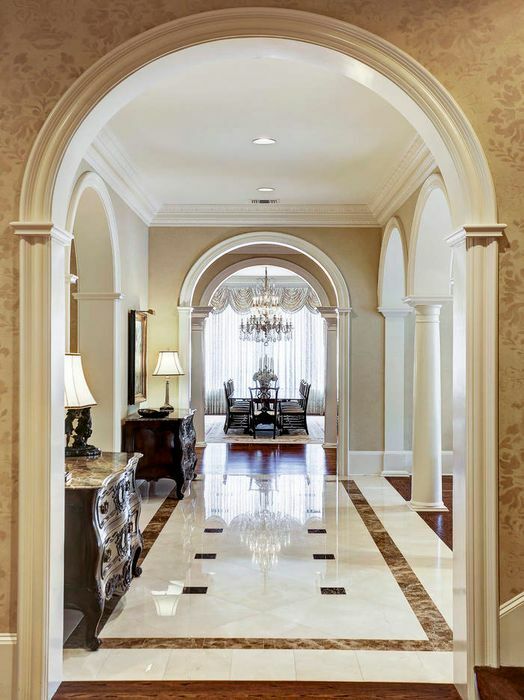 Note the marble flooring with its decorative inlays/border and elegant crown/base molding surrounding the space. 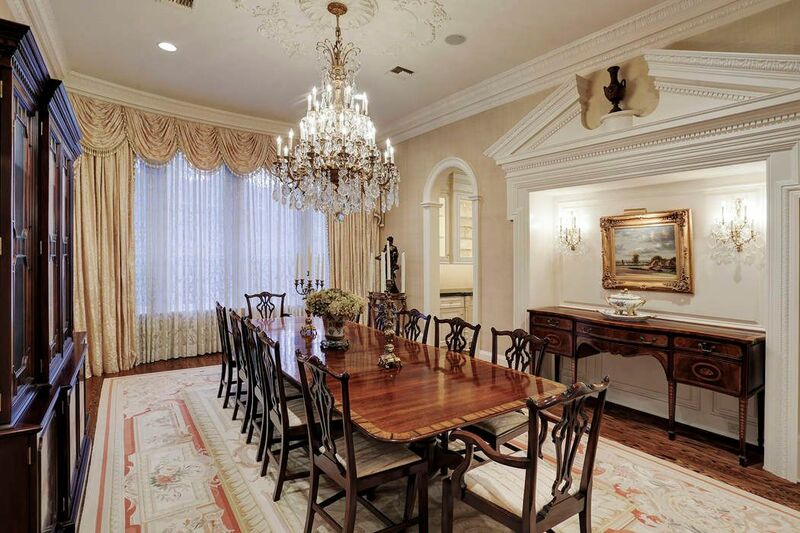 The DINING ROOM (21 X 15) features hardwood flooring, faux finished walls, bay window with motorized drapery, central ceiling medallion accent, furniture niche outlined with wood trimming/pediment motif, recessed lighting, built-in speakers. The WET BAR/RECEPTION AREA (18 X 8) is generously sized to accommodate not only a fully serviced bar but additional cabinet space with glass front lighted cabinets/painted white cabinets below granite counter tops. French doors allow outside access. The downstairs spacious UTLITY ROOM includes an abundance of storage and counter space, stone counter tops, shuttered windows, deep stainless sink, tile flooring, built-in ironing board. It is located close to the back door and mud room space. 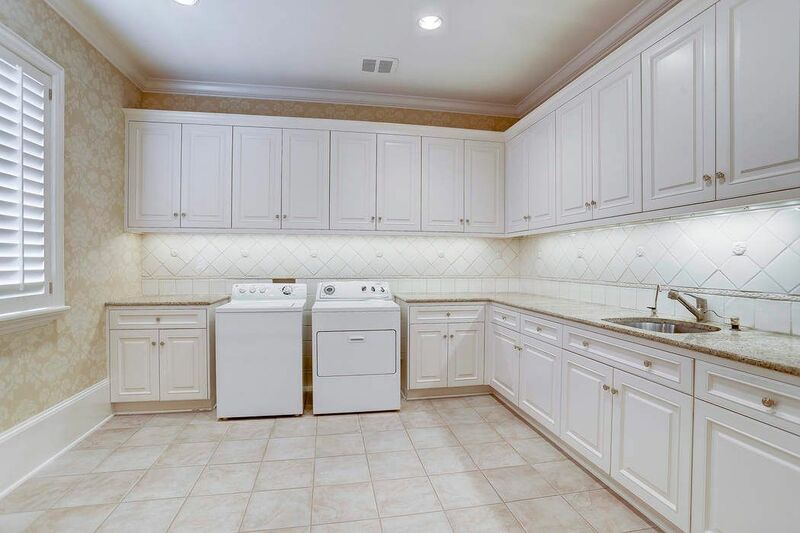 The KITCHEN (25 X14) is a chef's delight with its well organized counter/storage cabinets and top of the line appliances. 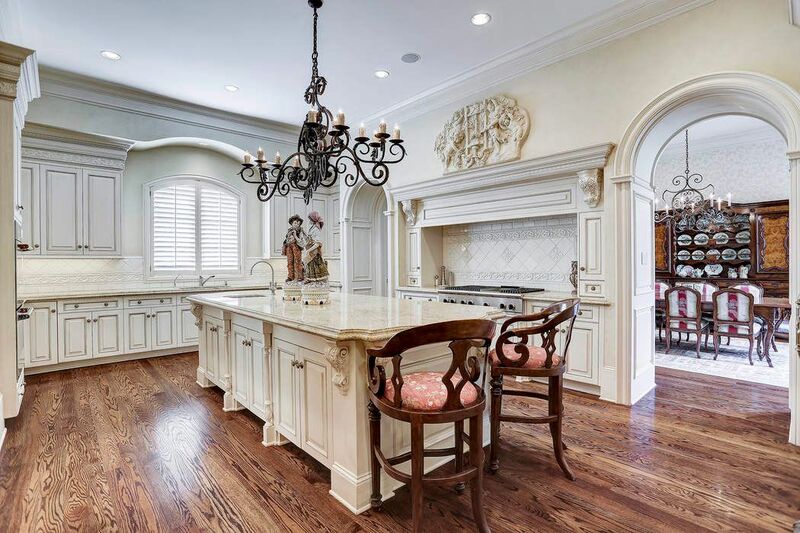 All beautifully surrounded by faux finished walls, custom plaster trimming, center island with chandelier/breakfast bar. 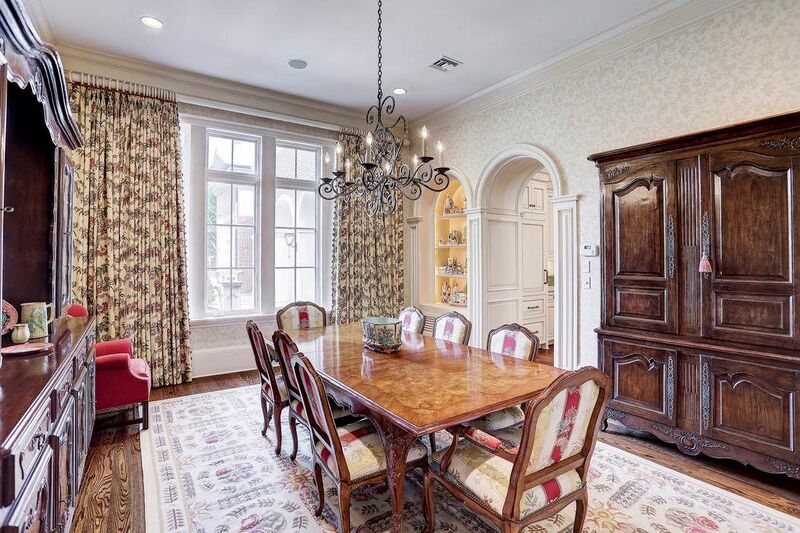 Just off the Kitchen is the brightly lit BREAKFAST ROOM (18 X 15) with its plantation shuttered windows/designer drapery, central iron chandelier, hardwood flooring, lighted display niches, hardwood flooring, crown/base molding, built-in speakers. 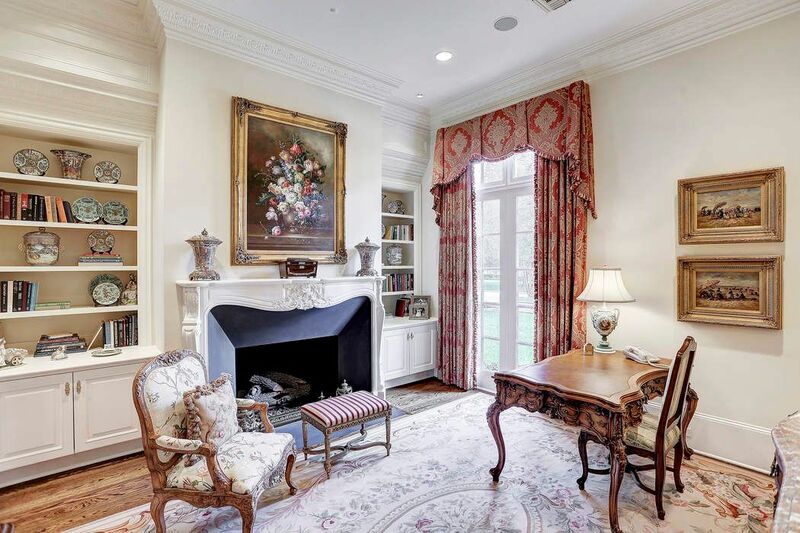 Charming describes the LADIES" STUDY with its central fireplace (slate surround/wood mantle) flanked by built-in cabinets/shelving, art/recessed lighting, fixed French window with drapery, pocket doors with transom and hardwood flooring. 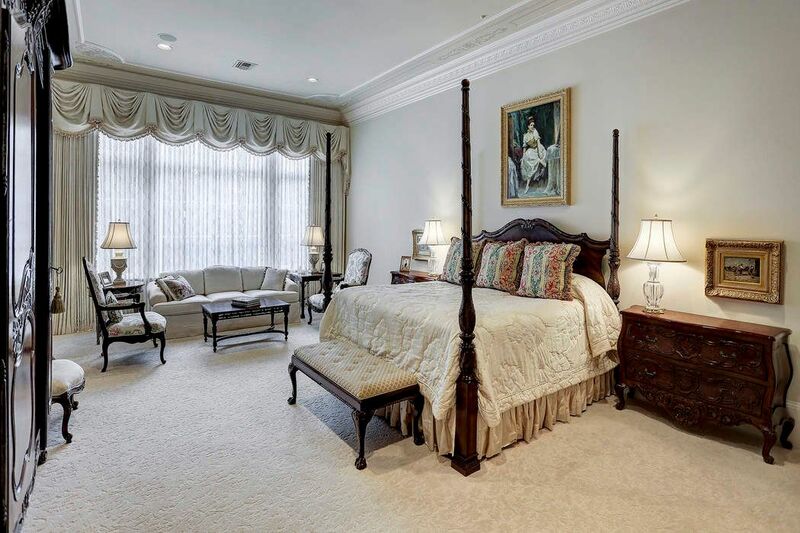 Great attention to detail is seen in the MASTER BEDROOM SUITE (26X17) and its exquisite crown molding, trompe l'oeil ceiling accents, motorized drapes, sitting area, under staircase storage, carpeted flooring, art/recessed lighting, en suite baths. A closer look at the windowed wall of the Master Bedroom with its elegant sheers and designer drapery - motorized for easy closure. 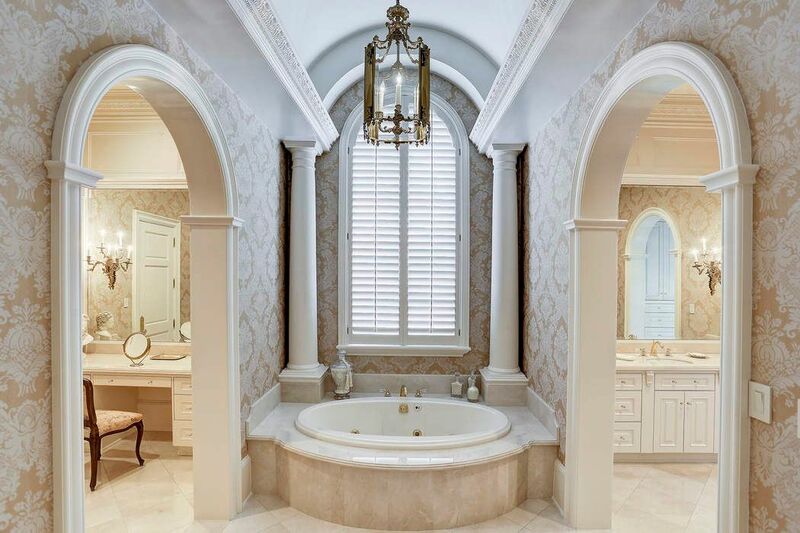 One of two Master Baths - this one with Kallista spa tub (marble slab surround/columns/pediment accent/barrel vaulted ceiling), etched glass front walk-in shower, stenciled walls, vanity table room with mirror, separate water closet, walk-in closet. 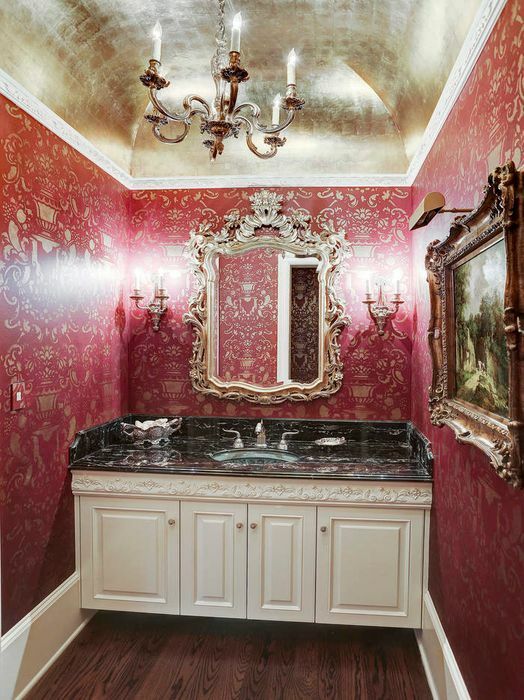 A closer view of the separate VANITY STATION with mirror, painted wood trim, stenciled walls, marble counter top and painted cabinets below. Still another view of the Master Bath with its stenciled walls, painted wood arched doorways, built-in cabinets/drawers and beautifully articulated etched glass doors for the walk-in showers with marble surrounds..
View of the grand front foyer STAIRCASE with its wood treads/painted risers and custom built decorative railing with bronze accents.The graceful curves of the staircase and art niches further enhance the luxurious ambiance of the residence. 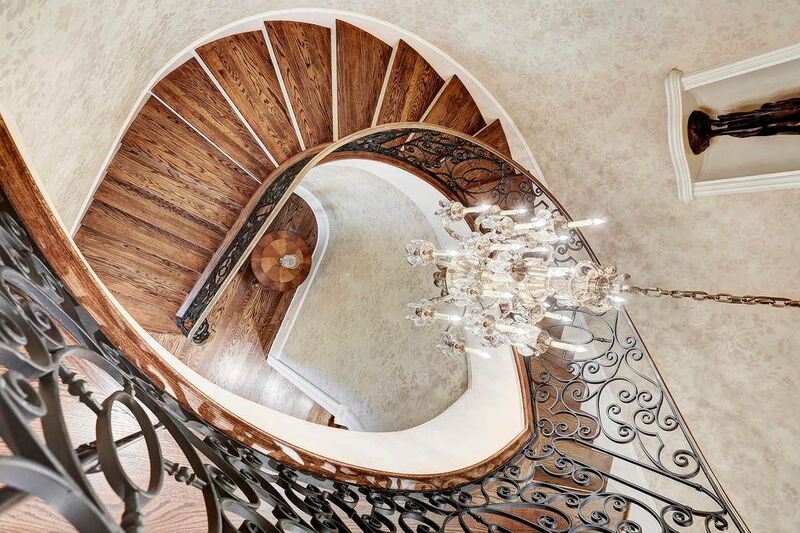 Another view of the STAIRCASE as seen from the second floor landing. 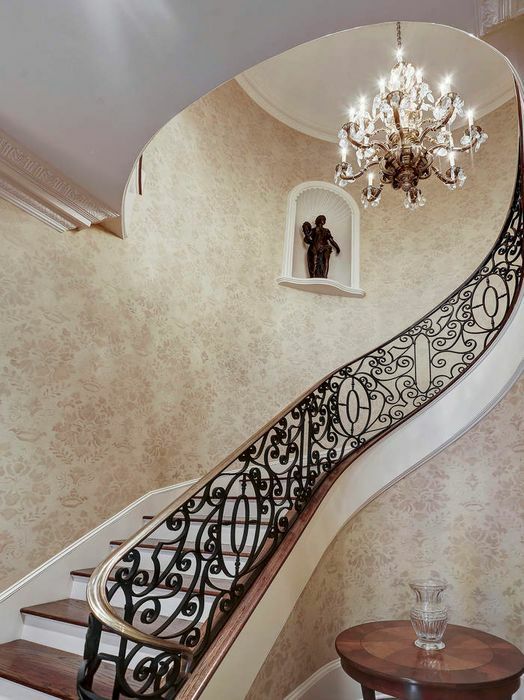 Note also the beautifully stenciled walls of the space and the detailed ironwork/brass detailing of the railing. 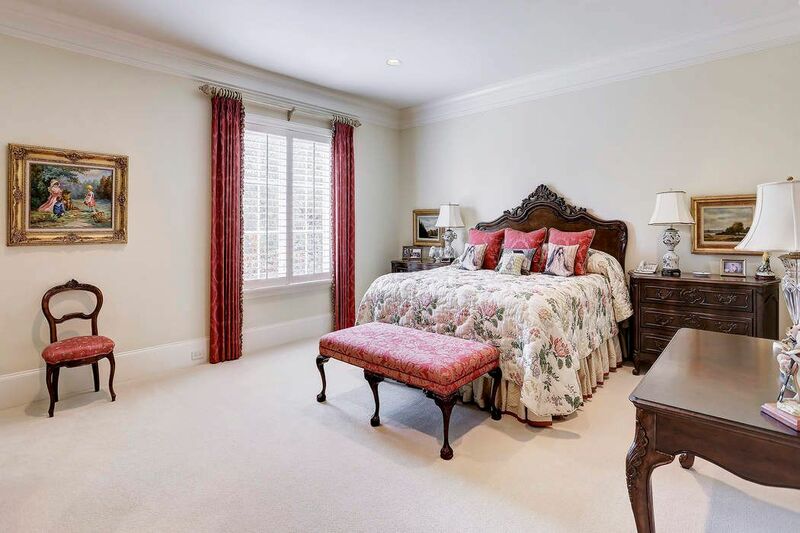 One of three second floor GUEST BEDROOMS - this one (16 X 14) including 10' ceiling, carpeted flooring, painted walls, plantation shuttered windows with drapery, crown/base molding, walk-in closet and en suite bath. 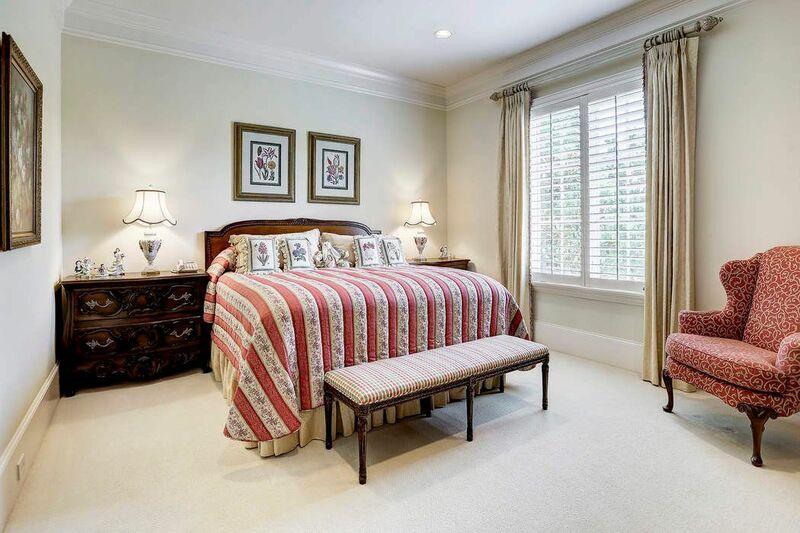 The second upstairs GUEST BEDROOM (15 X 23) features carpeted flooring, crown/base molding, plantation shuttered windows with drapery, walk-in closet, painted walls and en suite bath. 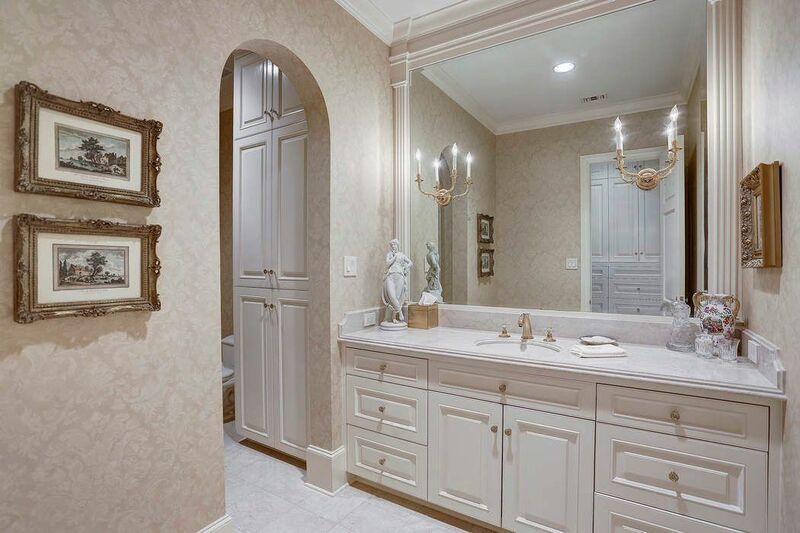 One of several GUEST BATHS - this one includes papered walls, decorative fixtures, marble tile flooring, marble slab counter/backsplash, wood framed mirror, tub/shower with marble tile surround/etched glass sliding door, linen closet. The upstairs FAMILY ROOM (28 X 21) is comfortably sized to accommodate casual gatherings. 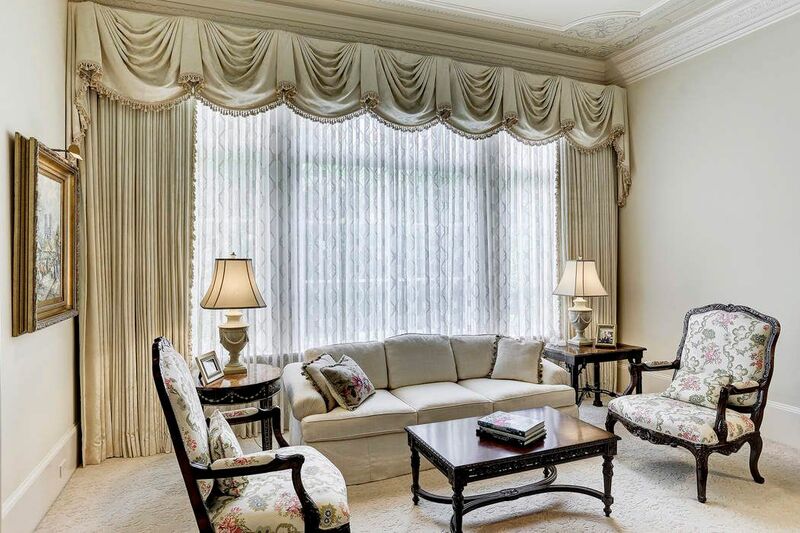 The room features shuttered windows with drapery, oak flooring, painted walls, crown/base molding, art/recessed lighting, painted walls, built-in speakers. The upstairs OFFICE (13 X 18) could also be used for a bonus room or exercise room. 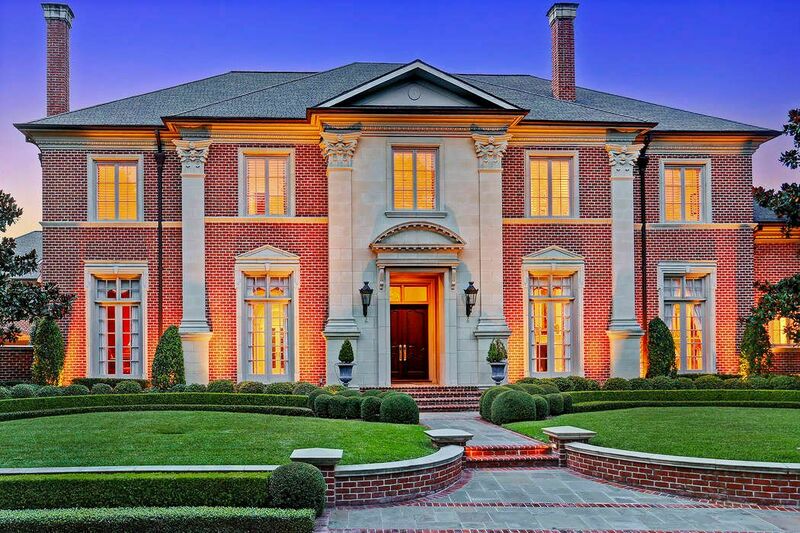 It includes hardwood flooring, shuttered windows, crown/base molding, recessed lighting and double door entry. The upstairs LIVING QUARTERS includes a living area with raised mansard roof/ shuttered window, kitchen with refrigerator/dishwasher/breakfast bar. bedroom with walk-in closet/en suite bath. Perfect for a mother-in law suite, adult child or quarters. 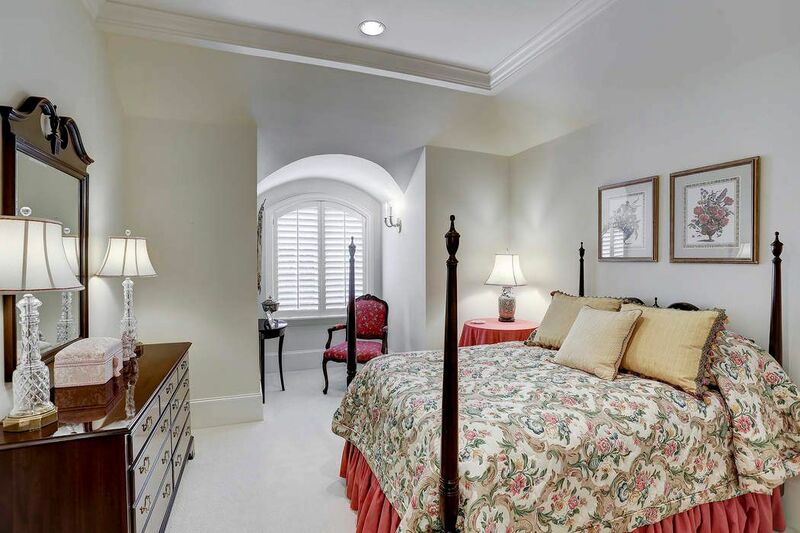 The QUARTER'S BEDROOM (12 X 12) is a cozy retreat with its carpeted flooring, shuttered dormer window, raised ceiling with recessed lighting,crown molding, painted walls, en suite bath and closet with built-in shelving. 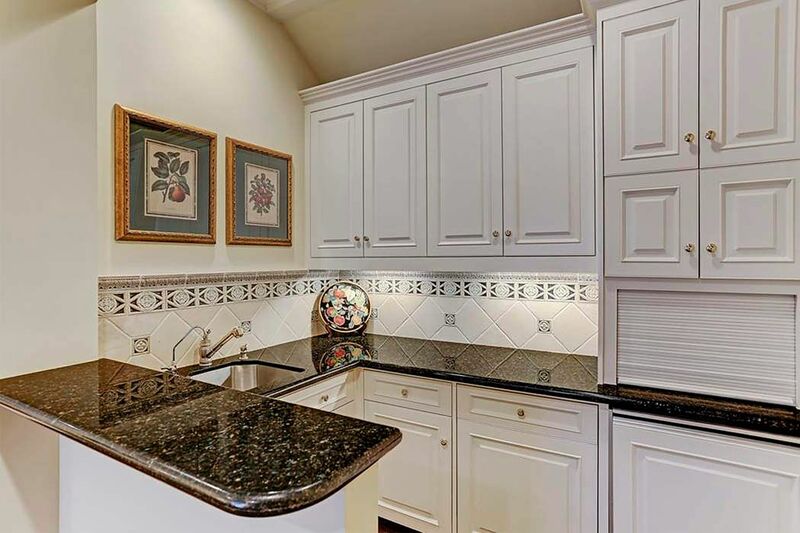 The QUARTER S MINI KITCHEN provides painted cabinets and drawers/ granite counter tops with decorative back splash/ under counter lighting, breakfast bar, stainless sink with filtered water faucet, Asko dishwasher and SubZero Refrigerator. The finely manicured formal BACKYARD GARDEN is beautifully viewed from the backyard patio with its dramatic stone railing and slate flooring. Another view of the BACKYARD showing the green areas - perfect for children and dogs to play and/or large enough for a pool! The residence's driveway it outlined by a handsome brick border and stately brick wall leading to the spacious motor court. The three car garage is further shaded with a series of arched openings which allow easy access to the home's side door. 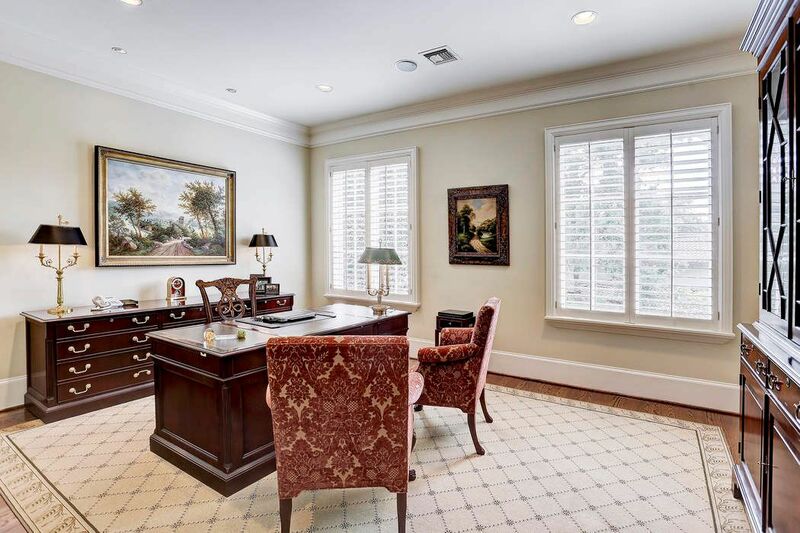 $4,550,000 5 Bedrooms6 Full / 3 Partial Baths11,107 sq. ft.
Gracious custom Georgian residence in Stablewood designed by Robert Dame/built by Barnett Custom Homes. 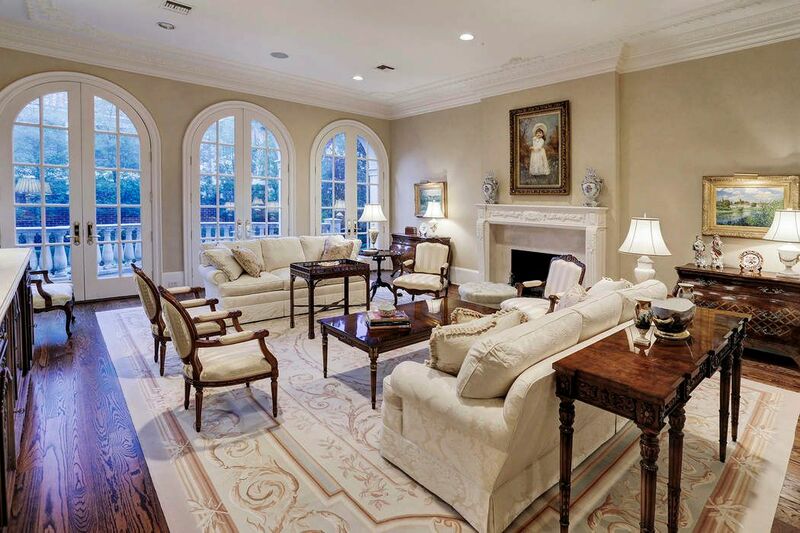 Classic details, beautiful high ceilings in entertaining areas with arched openings. 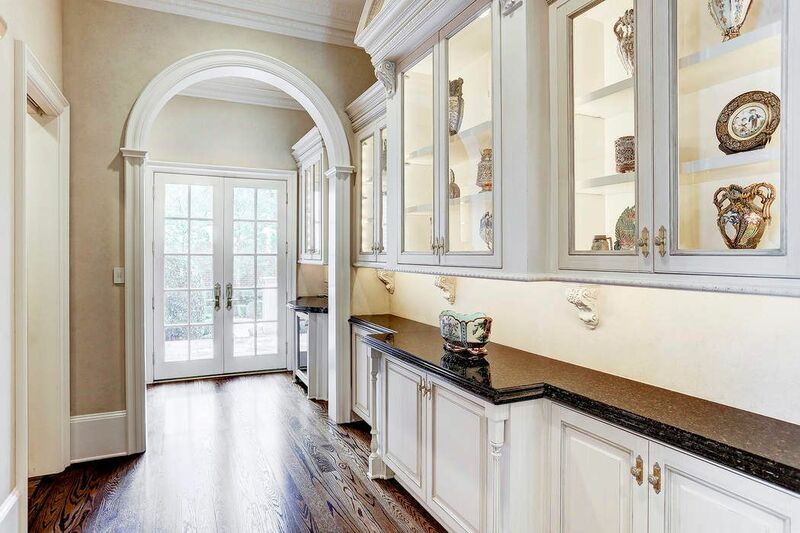 Chef's kitchen adjacent to magnificent dining room and spacious breakfast room. Elegant library and ladies study down. 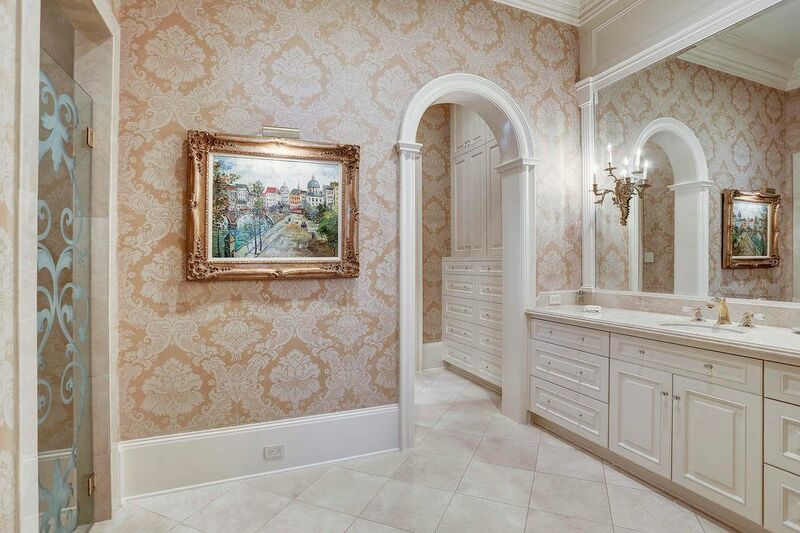 Exquisite master down with dual baths/closets. Three bedrooms en suite up, office, guest apartment/quarters with bedroom/kitchen/sitting room. 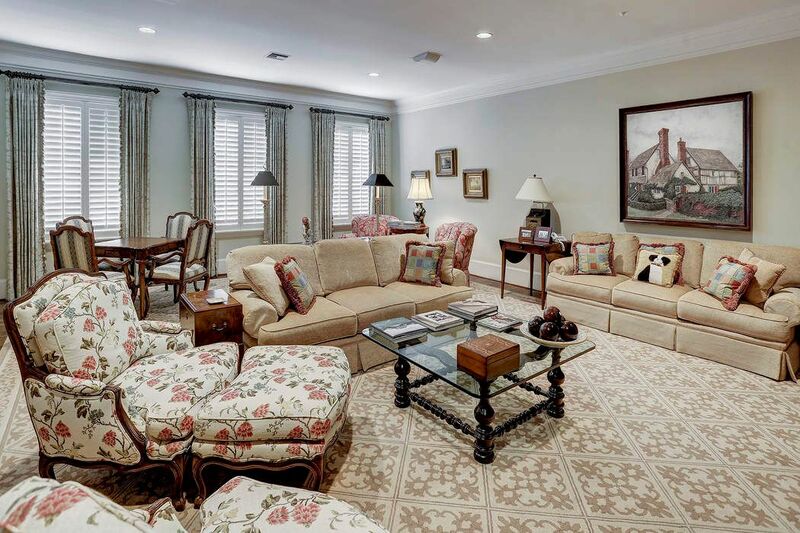 Game room, elevator, three-car garage, 20,691+/- square foot lot.